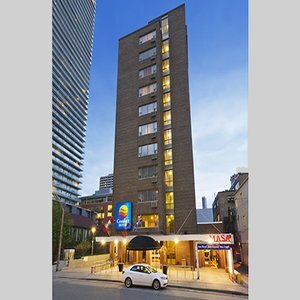 Comfort Hotel Downtown Toronto is close to subway, Yorkville, Eaton Center, Pantages Theatre and Restaurants nearby. Also convenient to CN Tower, Sky Dome and Convention Centre. Parking: 21.00 CAD + 13% HST per day per car per night with in/out privileges. Offered at arrival on first come first serve basis. Cash paying guests require two pieces of ID(one of which must be a Government issued photo ID) plus the total room and tax along with 100.00 refundable deposit at check-in.